The List Files in Directory	component creates a list of filenames for a given directory. 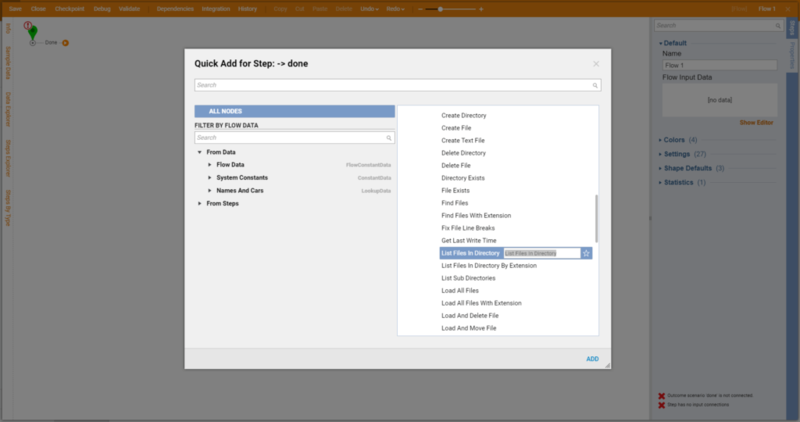 Create a flow to list the files in the Flow Designer . In the Toolbox	panel, under the category Integration > File	, drag a List Files in Directory	component to the workspace. 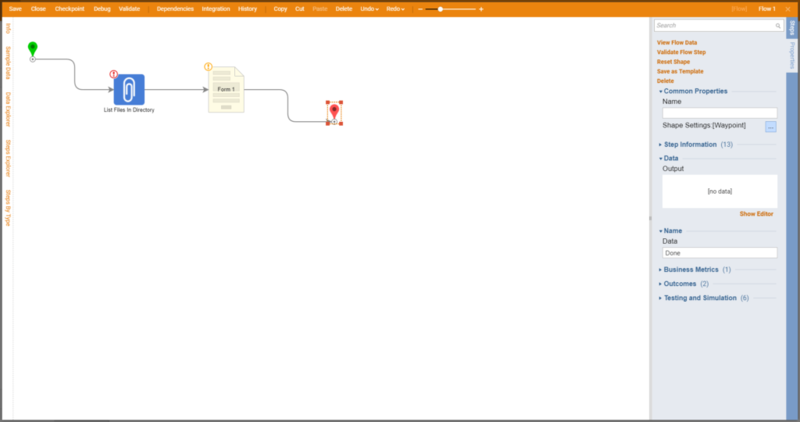 Our example flow will display a form that lists the files in our the directory C:\Program Files\Decisions\Decisions Services Manager	. The form,List Files,	was created for this example. It simply contains a List Box	component that is configured to display a string datatype. Our first step will be to get a list of the files in the directory. In the Flow Designer&apos;s startup window, under Integrations > All Integrations > File	, select the List Files in Directory	component and click Add	to add it to the workspace. Our next step is to add a form. 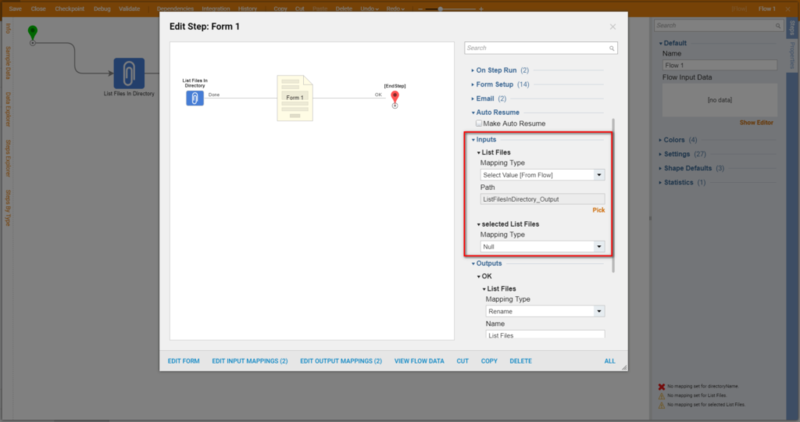 Add the List Files	form to the Flow Designer. 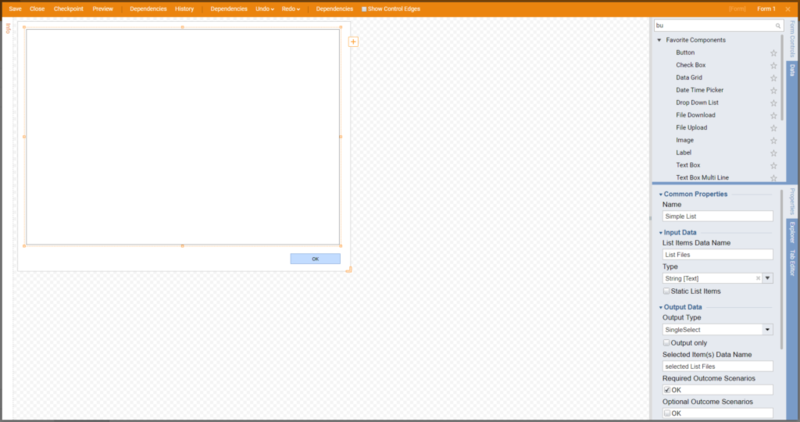 This form can be found in the Toolbox	panel, under the category Forms [Interaction] > Current Folder	. Since the components are placed and the outcomes are connected, the next course of action is to configure the flow steps. 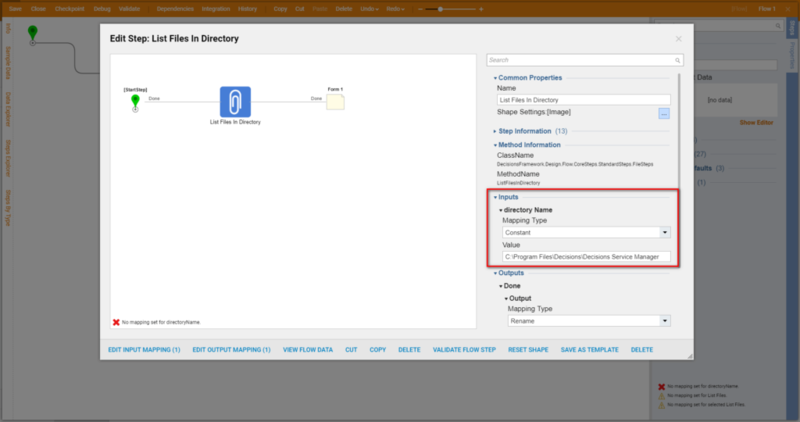 Double click on the List Files in Directory	step. From the Actions Toolbar	select Edit Input Mappings	to open the Mapping Editor. List Files in Directory	accepts only one input - directoryName	. Since we know the name of the directory to use, give directoryName	a mapping type of Constant	and a value of C:\Program Files\Decisions\Decisions Services Manager	. This completes the mapping for the List Files in Directory	step. Click OK	to save the changes and close the Mapping Editor . Configure the List Files	form by selecting it and clicking the link Edit Input Mappings	. List Files	form has only one input - FilesFromDirectory	- which is mapped from ListFilesInDirectory_Output	. Click OK	to close the Mapping Editor. Save and close the flow. Click the Debug Flow	link. 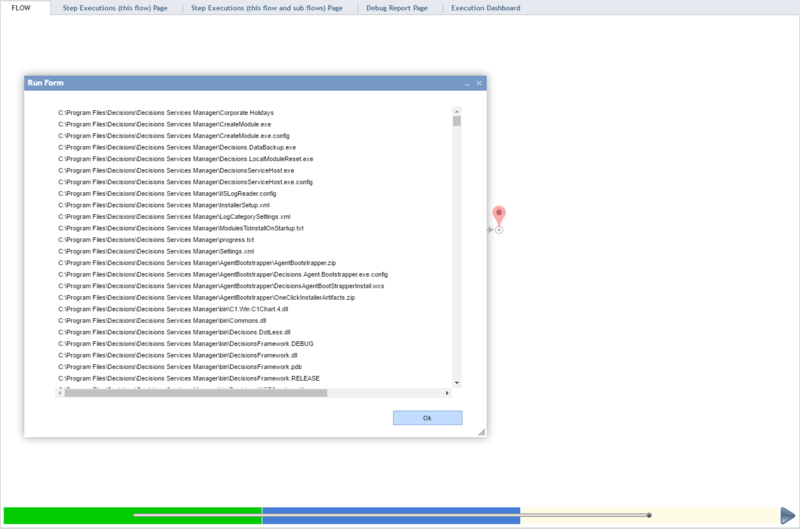 A form containing a list of all of the files inside the folder C:\Program Files\Decisions\ Services Manager	displays.